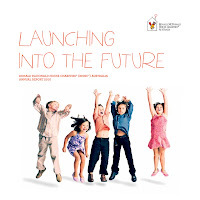 "Ronald McDonald House Charities: Annual Report"
One of the great joys of running a successful business, large or small, is having the ability to choose clients. Here is a client The Hard Word chose and has proudly worked alongside for several years. Ronald McDonald House Charities (RMHC), boiled down to its most basic ingredient, provides near-hospital accommodation for families of seriously ill children. In reality, of course, it does so much more. It provides essential support for families when they need it most. The charity's staff are a shoulder to cry on and a friendly face to consult with. The charity's guests are suffering what is unquestionably the single most emotionally painful experience that life can ever throw at anybody - a threat to their child's wellbeing. If their child pulls through then RMHC provides a Learning Program to help them catch up with schooling, and RMHC even offers Family Retreats to give the mums, dads and kids valuable time together to finally relax. It was a great honour to be asked, as freelance professional writers, to pen this annual report which contains many stories of families that have come through a terrible experience. We should all have a chosen charity with whom we share our spare time and our talents. For The Hard Word, that organisation is Ronald McDonald House Charities. To find out how you can help, please visit http://www.rmhc.org.au/help.